Ambrosia wrote: How do you know when you get these promotions? Does someone PM you or something? Sorry! I'll catch on quickly I promise! Carrie (urcoolcarrie) will put it in a post here. Stating what your new rank is. Usually we don't run through pages this fast so you will be able to see it, if not there will usually be someone saying congrats on your promotion. pandancer wrote: EDIT: I did have this super long, confusing post explaining what I meant, but Shannon beat me to it, and hers made a lot more sense anyway. Yay for Shannon. I'm gone for a few hours and I come back to 8 pages and several new members! Sorry everyone! First off, the new members. Welcome to the crew, Dazzledand Ambrosia! I'm sorry I couldn't introduce myself earier. I am Carrie, HR Manager of EDC, Inc. I'm in charge of giving promotions and keeping track of members. You are both Trainees now! Congratulations! LindsOuiment, you WERE on Clean up Crew, but you posted so much, you went to the level after that. You are a Hand Laborer! Kristin, you are a Wrecking Ball Trainee! Ambrosia, I know you are new, but I didn't get here soon enough to award you the rank of trainee as your first official rank. You actually posted so much you are now on Clean up Crew! Whew! Ok, the hard part is over. Let me tell you, its hard flipping through pages and pages of a notebook time and time again to record everyones posts. Hey, its fun though. I like this job. Just to update and answer everyones questions about how many members we have, we currently have 33 crew members! My niece is currently sitting on my lap telling me that she REALLY wants to type something to my friends, so I have decided to let her. Heres her message everyone! haha. She is 5 years old. I didn't tell her what to type at all. She just said what she wanted to say and put on what faces she wanted to put on. I'm glad she likes Emmett already, and shes only 5. Hahaha! Heck no, I don't even touch energy drinks. =P I'm just drinking Mountain Dew: Code Red, haha. Haha. Its about 9:15 here. We snuck some Mountain Dew a little bit earlier today...I don't think shes going to bed any time soon. translation: thank you caomb. you rock. Hi!! I'm vampirechick101 but you can call me Mimi welcome to E.D.C Inc.!! lets' break down some houses!!! what would Emmett look like a girl? CONGRATS PROMOTED PEOPLE!!! keep it up!!! WOOT WOOT!! As far as the question goes... 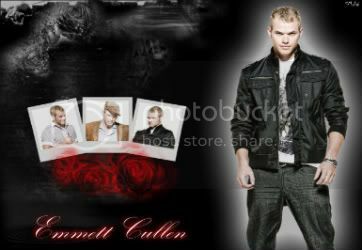 I just cannot picture Emmett being female. I just don't see that working out.. everything about him screams masculinity! hahahaha!!! that picture/banner you made is HILARIOUS!!!! Oh my gosh. I just died of laughter, I think. Its a perfect description of what we are going to do. 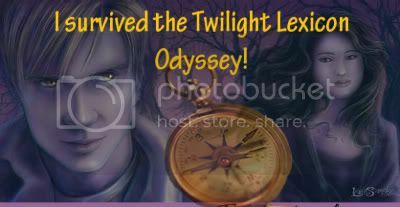 I LOVE that banner iLoveTwilight. That's AWESOME! So cute.